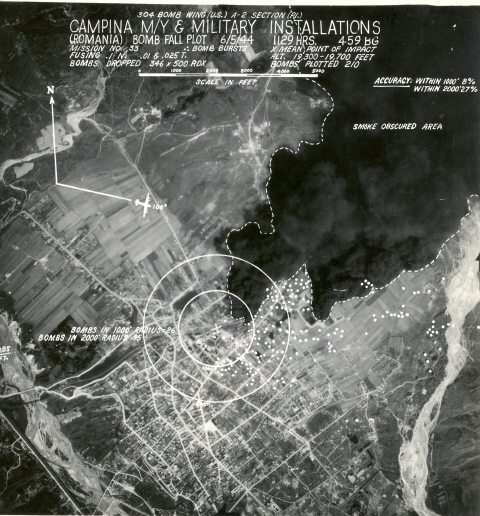 This strike bomb photo and Mission Photos of M#s 43, 86, 91, 98, 112, 162, 167, 194, 237 R,and 241 were provided by Marshall Slocum from his Dad. 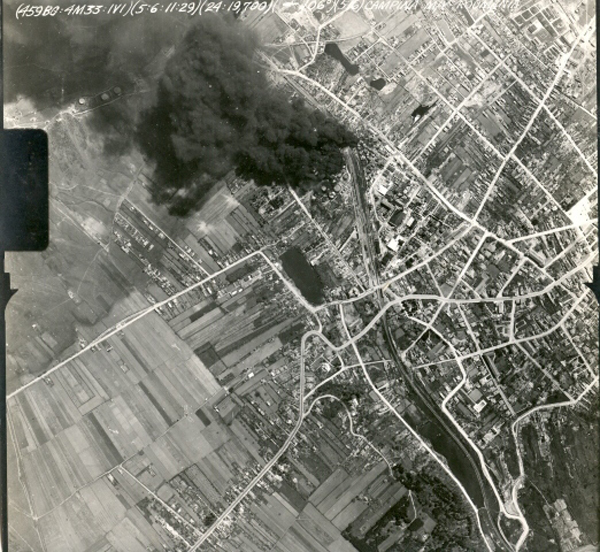 The Ploesti Oil Refinery Complex in Romania, supplying over one third of Hitler`s petroleum needs, was subjected to 6 major Bombing Missions by planes of the 15th AF in 1944 after the initial low-level mission in 1943, in what was called the Ploesti Oil Destruction Campaign and the complex was almost completely destroyed before it was over-run by the Russian Army, in late 1944. Mission No. 33 was one of the first 459 Bomb Group high level bomber formation raids on the Ploesti Oil Fields campaign in 1944 after the first raid in 1943 from North Africa as a low level daylight raid resulted in heavy losses in U S aircraft due to large concentrations of enemy fighters and German flak including flak guns on railroad cars.